Valleys Kids children, enjoyed a surprise Easter treat when staff from Pontypridd Sainsbury’s branch: Joyemma Lewis – PR Ambassador, Tony Sims, Emma Evans and Deputy Manager, Dale Shaughnessy played the role of Easter Bunnys delivering a tower of eggs to children enjoying the Easter play scheme in Soar Centre in Penygraig. Over 300 eggs were donated which meant that we had enough for children in Dinas, Rhyfeyfelin and Penyrenglyn Centres. As you can see the children were thrilled and eggcited. 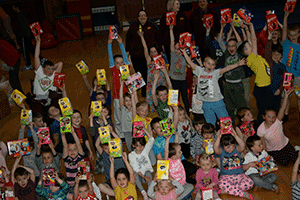 Big thanks to Sainsbury’s for giving Valleys children this special Easter eggsperience. Well, what a night! Mess Up the Mess came to Soar Centre with their Youth Theatre and performed their latest piece Heritage. It was written by Daffyd James a name you will remember from the Village Social and was just as funny and just as entertaining. The piece took the audience on an emotional rollercoaster and left us questioning whether we are right to conform or should we dare to question the man in charge? Would either way make a difference to our ultimate destiny? 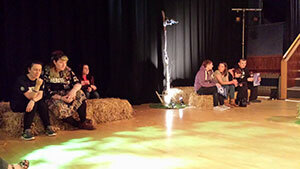 The Youth Theatre had you on the edge of your seat, laughing along with them and feeling their pain. We all had a brilliant night and can’t wait for their next show to cross our paths. Apprenticeships in Creative and Digital Media in Wales – NOW RECRUITING! This year there are up to 30 vacancies based in South East, North and South West Wales. To apply or for more information click the link below. To have any questions answered click this link.